Purple is one of those colors that you love or hate, but for those that love it and yes I am one of those, we really love the color! When you decided on a wedding theme there was probably no real competition because you have always known you will have a purple wedding. As with all colors purple has many shades, you might want a deep eggplant color for a dramatic look or a soft lilac for a more girly theme. Either way there are lots of places to find the ideal invitation. Seriously one of the cheapest ways to make a simple invitation is to make your own and one of my favorite ways at the moment is to design invitations using an online graphics program like picmonkey, which is brilliant and it is free too! When you have created the look you want you can then have them printed at a printers. 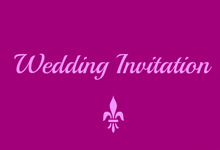 A modern styled invitation would be a deep purple card with white graphics. These you could have printed as a postcard to keep the costs down. Here are a few that I have put together using PicMonkey, if you click on the photo a pdf document will open that you can then print and use if you want. When it comes to your invitations it is really easy to spend more than you intended. One way to avoid doing that is to buy your invites online that way you won't be talked into having more than you need. I often hear brides at wedding shows talking to stationers and the suppliers will be getting really excited and talking about all these really interesting things that they can do. It is at that moment that you need to walk away or be really firm to your budget and I know that can be hard because you want the best wedding invitation that there has ever been. At the end of the day it is only an invitation, sure it's to the best wedding this year but wouldn't you rather be spending your wedding budget on something that you can all enjoy together? You don't need to send save the date cards, just send your invitations early if you are worried that your guests may book a vacation and won't be able to make it. You don't need RSVP cards, instead set up a wedding email address for your guests to reply to. If they haven't an email account then they will reply by letter.